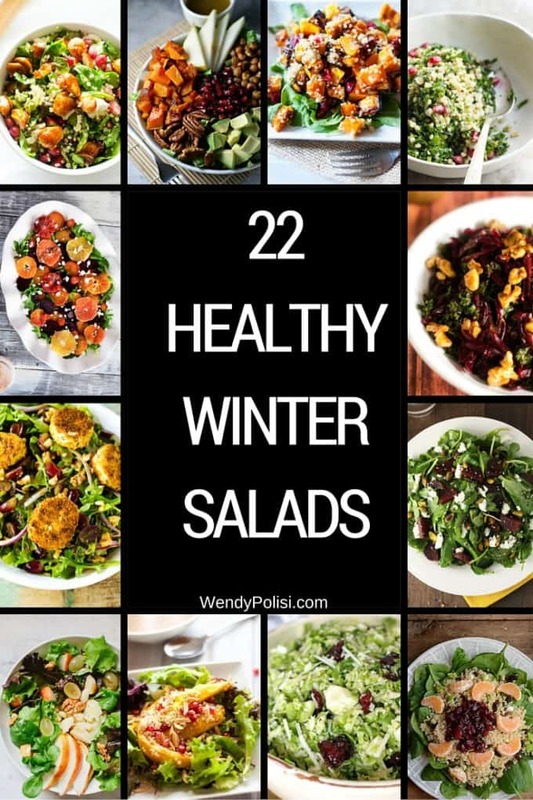 22 Healthy Winter Salads to Supercharge Your Diet! 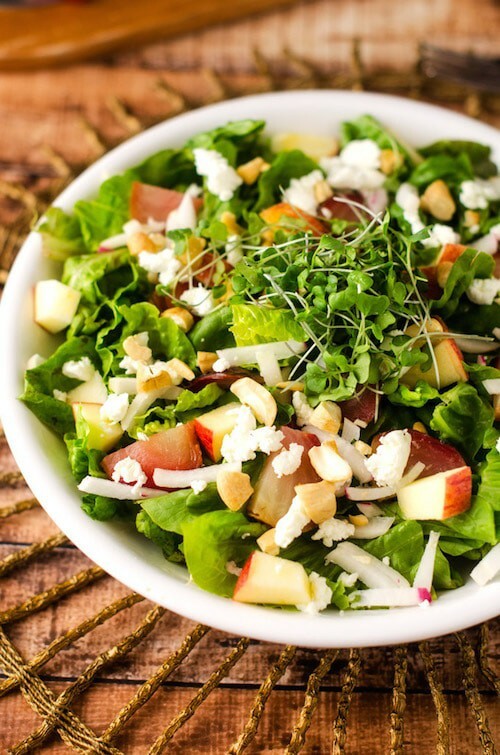 Don’t let the more limited produce offerings in the winter stop you from enjoying salads! It is time to get creative. These delicious winter salads highlight the best the season has to offer – from winter root vegetables to seasonal fruits. People always look at me crazy when I say that there are few things that I love better than a good salad. But it is true! There is something about the subtle layering of flavors that happens when you combine fresh seasonal produce with a tangy dressing and top it off with a sprinkling of nuts. Done right, it is magic. While salads may be the last thing on your mind when winter rolls around, I’d argue that while the cold weather does change the produce that is available to you, there is so much to be excited about! Roasted root vegetables, pears, pomegranates, even roasted fruit! 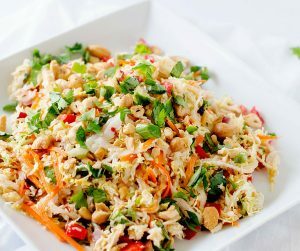 If you are looking to up your salad game, you are going to want to check out these fantastic recipes. There is no way you can help but be inspired! Hope you enjoy! If you are looking for more salad recipes, you can check out my salad archives here and this Pinterest board. 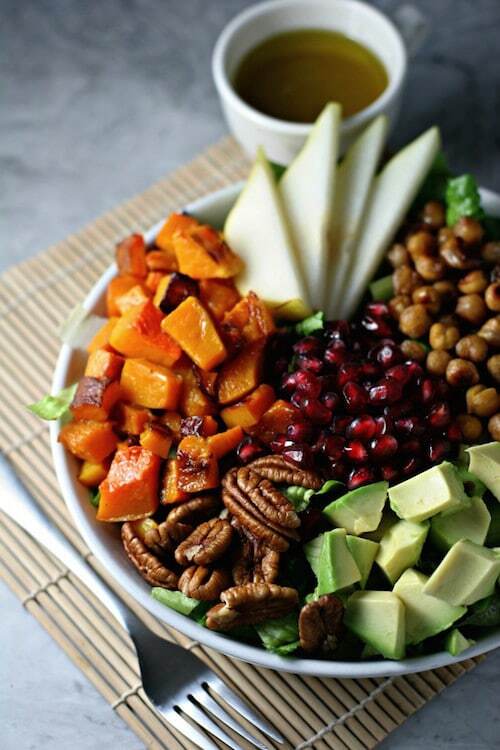 Who needs meat in a Cobb salad when you have cinnamon maple chickpeas, pomegranate, pears, and pecans?! I think I could eat this salad every week and not get bored. Looking to add a festive touch to your holiday table? This recipe will sure do it! With fennel, grapefruit, walnuts, and pomegranates, this simple dish will brighten up any day! A beautiful side dish, or a delicious vegan main? You decide! 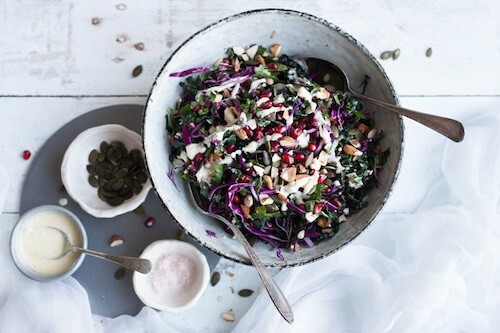 One thing is for sure – this nutrition pack salad will give you every thing you need to power through a cold winters day! This recipe is backed with the very best ingredients of the season! 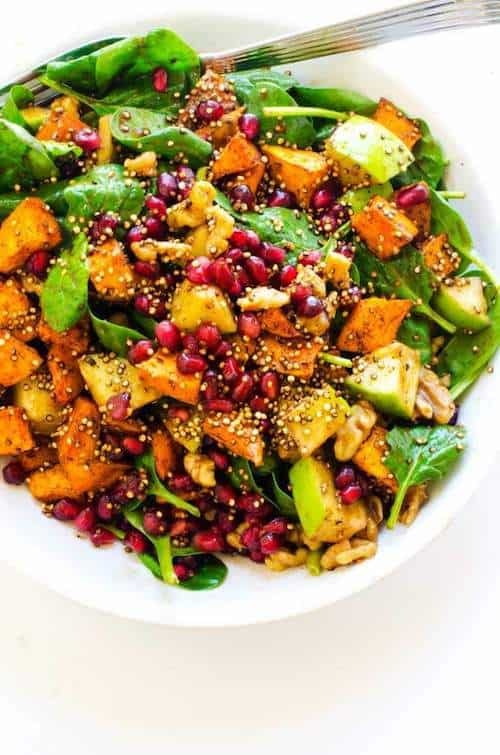 Baby spinach, sweet roasted pumpkin, juicy pomegranate and pear are topped with crunchy walnuts to create a dish that is as healthy as it is delicious. You are going to want to face plant into this delicious bowl of greens. 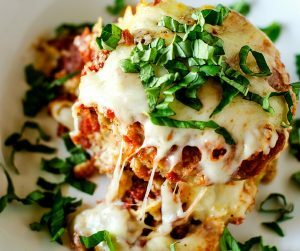 It is perfect for your holiday table, but works just as well for an easy weeknight meal. This healthy winter salad combines puffed millet with kale, persimmons, walnuts, and pomegranate seeds. Topped off with a lime dressing, and you have got a dish full of bright flavors that will brighten up the darkest winter day. 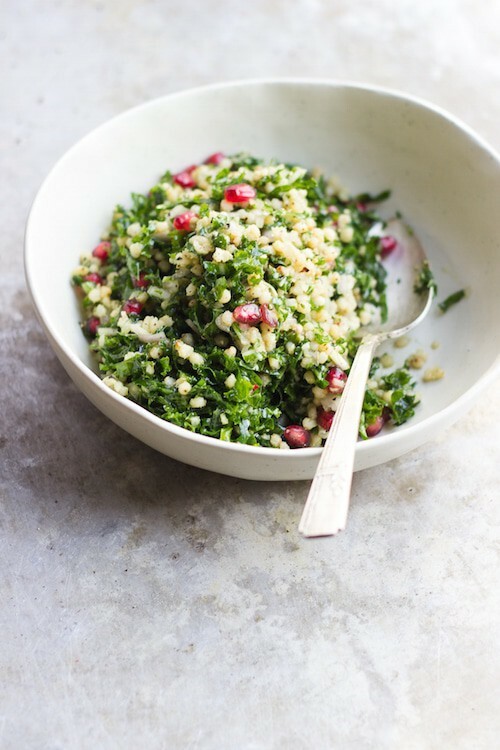 This Winter Tabbouleh Salad is a fun twist on a classic! With hearty greens, pomegranates, bulgar, and clementine juice, this one is anything but boring. 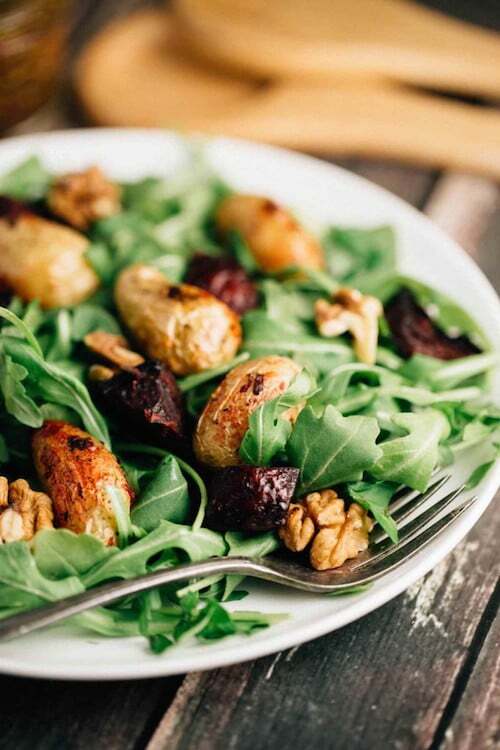 When you add warm winter vegetables over baby arugula, you get the best that winter has to offer in a deliciously healthy meal. 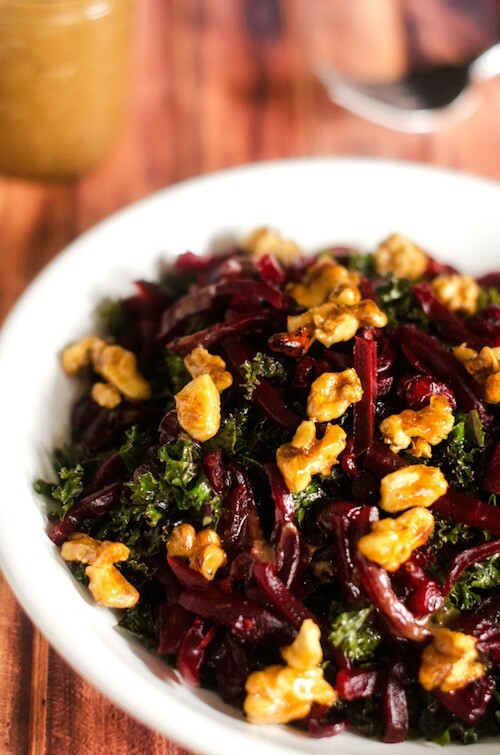 This Kale and Beet Salad will leave you nourished and feeling your best. Beets are great for detoxifying the liver, which is especially important as we indulge over the holidays. This beautiful salad deserves a spot on your holiday table. The star of the show is the crazy good Blood Orange Dressing which pairs perfectly with fruit, nuts, and cheese. When you combine freshly made dressing with dried cranberries and Parmesan cheese and toss it with shredded Brussels sprouts, you get a delicious dish that you can have on the table in no time. This delicious salad is light, fruity, and nutrition packed! I like it as a side dish, but it is hearty enough to work as a main course too. 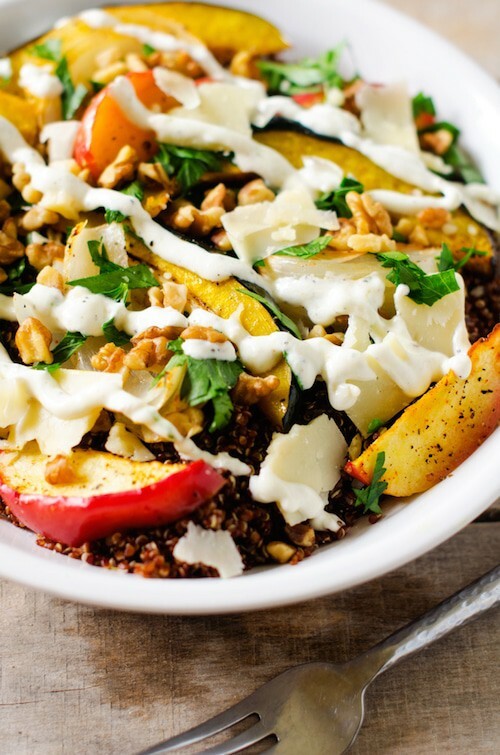 If you are looking for something a little different that is also beautiful on your holiday table, give this Sweet Potato Quinoa Salad a try! With crispy quinoa, sweet potato, pomegranate, apple, and walnuts, this healthy salad is like eating the rainbow. With cranberries and clementines, this simple recipe feels like a treat! It make the perfect simple lunch that will keep you light on your feet all afternoon long. 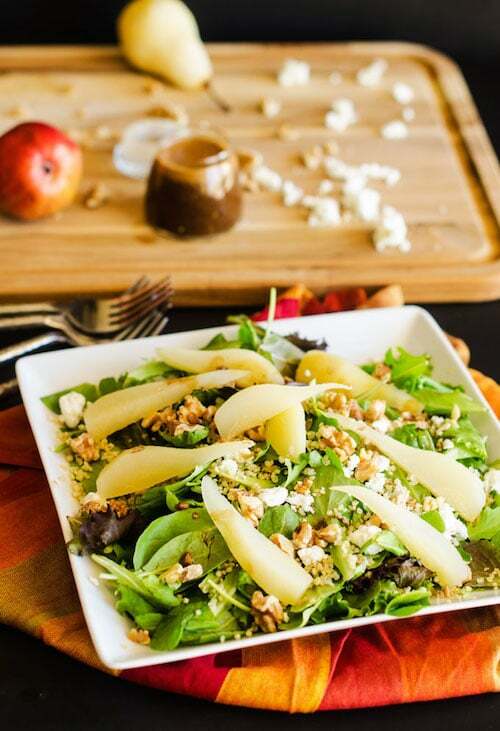 This hearty salad has the best flavors of fall! It is a great one to make on the weekend to keep your healthy eating on track during the busy work week. 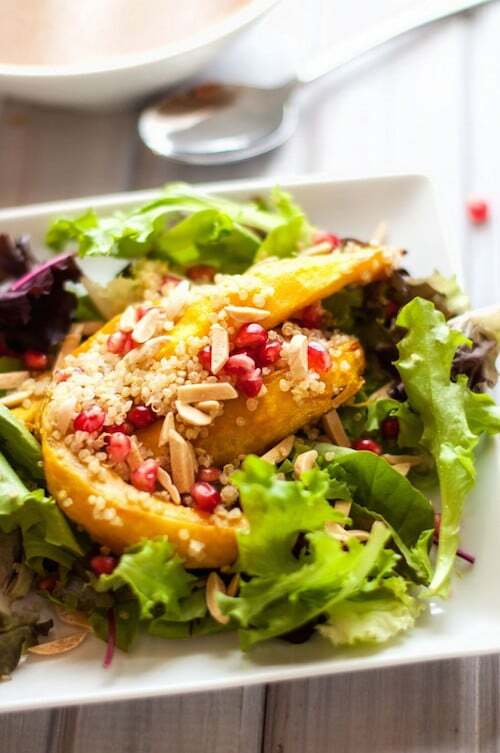 The star of this beautiful salad, are the candied almonds. You may want to double the recipe for them, because they tend to disappear quickly at my house. 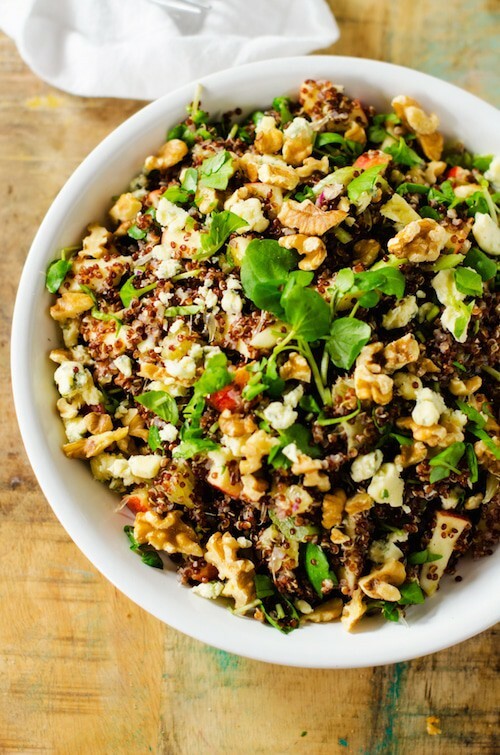 With candied pecans and feta cheese balanced out with quinoa, kale and broccoli, this delicious salad is going to rock your plate. Looking for a fruity salad with all the best flavors of the season! This Roasted Fruit & Vegetable Salad is a great one to try! 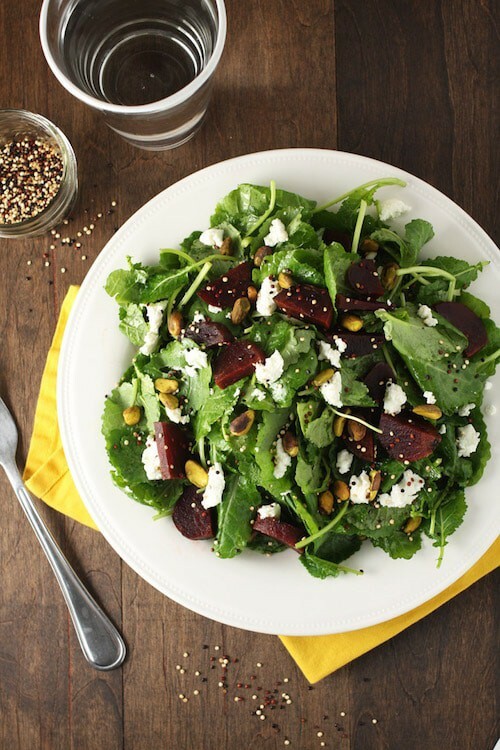 This simple salad combines two of my favorites – beets and goat cheese! 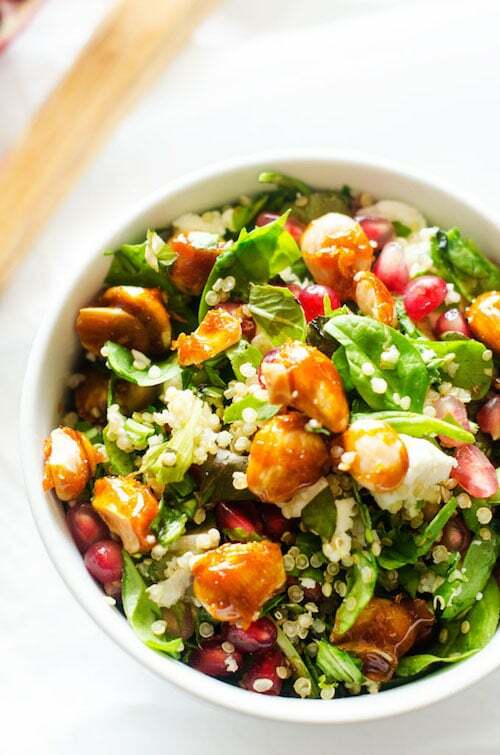 With crispy toasted quinoa, pistachios, and a tangy vinaigrette, this is as delicious as it is nutritious. If you like poached pears as much as I do, this is going to be your favorite during pear season. Light and refreshing, this is perfect to serve at brunch. You can’t go wrong with anything that involves warm goat cheese in my book! This delicious dish is the perfect vegetarian entree. It is healthy, but it totally feel like you are indulging. This simple dish has just a few ingredients, but really packs a flavor punch! It makes a great holiday side. Thanks so much! I have never had potatoes and beets together but it looks amazing. Love all the salad recipes! Can’t wait to try them ! 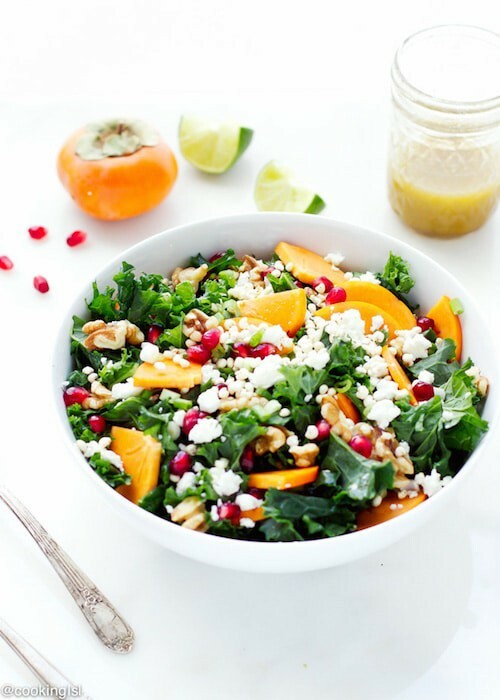 Thanks for including my persimmon kale salad! Thanks Mira! Your salad looks amazing. I don’t know that I’ve ever had persimmon. These salads look fabulous! Can’t wait to try some of them! What an amazing roundup! Definitely pinning this. Thanks for sharing my Beet and Goat Cheese Salad! Thanks Katie! I have that salad on my list to try!